"The Albersteins have developed an outstanding web based software system that captures both the philosophy and the business model of the OCS. I see this innovative software as the next step in the natural development of both my research and the OCS. I enthusiastically and wholeheartedly endorse The Career Activity Management (CAM) System as the modern continuation of my work." "Since our introduction of the CAM System in December, 2009, we have experienced a significant and consistent increase in advisor retention. Our fourth year retention has grown from 22% pre-CAM to 47% today (2014). Put simply, we can now hire 16-18 people each year and assume that half will stay. "CAM has proven to be a great tool for our agency, truly field-centric, highly logical and easy to use. Built by people who really understand our industry, they also know how to provide exceptional customer service. I can recommend it without hesitation. " Pacific Advisors, Guardian Life Ins.Co.
" In true measurable hours, I can easily say that the CAM system saves me 4 hours of work each week. This, of course, allows me to focus on what really drives my revenue...being in front of a prospect/client or working to get in front of a prospect/client. "The Albersteins have developed a one of a kind activity tracking tool for agencies. It also tracks case progress from prospect inflow through the entire sales cycle. I believe this tool is a game changer for leadership as well as agents"
"The CAM System has proven to be the perfect tool to help me develop and coach my agents. I have "real time" information on their activity and inventory so I can see what they are doing well or where they may need improvement....I wholeheartedly endorse and recommend the CAM System whether you are an agent or running an agency." "Our agency implemented the CAM System and the results have been excellent! The CAM System has allowed our producers to organize their prospects and business activities, and at the same time allows our management team to access useful reports for our coaching and study groups." "The CAM system has solved my practice succession problems. It allows me, my successor and our staff to communicate and coordinate where we are on every case. We love it." "The CAM System has provided a systematic way of keeping on top of all of my cases regardless of where they are at in the sales process. It has become invaluable in coordinating with my assistants and I'm certain this tool is going to have a long term positive impact on my business." 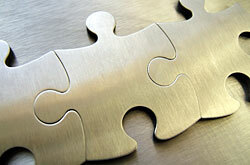 Our firm does a significant amount of joint work between Advisors. The CAM System has made it so much easier for Advisors to track the cases they are working on together which in turn builds trust and a culture of joint work for the benefit of the client. It has also reinforced our veteran Advisors on the importance of adding new clients. Finally, for those building a firm, there is no better way I know of to make sure that everyone is on the same page, and the CAM provides an evidence based system of tracking the key activities that not only build a practice, but a firm. "I really love this software. I am using it to keep track of my short and long term inventory as well as the value of my active clients. Very few people are aware of their active client count and value, and I feel privileged to have this valuable tool." "The CAM System has changed the way we manage our new associates. It has helped them to keep focused on the right behaviors necessary to succeed in the business.....with clarity and confidence." "I made Million Dollar Rountable for the first time in 2012, and I couldn't have done it without the CAM System." "Before using the CAM system I was concerned that business was falling through the cracks and I was missing out on sales. With the CAM I am able to keep track of my prospects and inventory and follow up in a timely manner. The CAM system has increased my production and truly been a lifesaver for my business. The Albersteins know the financial services industry and the CAM is a direct result of that insight and understanding." Need more information about our products? Give us a call or send us an email. We would love to answer any questions you might have. Introducing the Web based CAM System from Barry Alberstein on Vimeo. For pricing information or to order, call Career Activity Management at 360-371-7470 or 360-371-7600. CAM System Overview from Barry Alberstein on Vimeo. The CAM System™ is now available as a web based software program designed to help you manage your financial services practice. It handles the three major areas required to build and manage a successful practice; Activity, Inventory and Relationships. With three simple steps you can organize, analyze and control your practice with unprecedented clarity and efficiency. Enter your goals, sales activity and open case inventory and you’re ready to tap the power of this innovative new system. Because the new version is web based, you can exchange information with your assistant, coach or marketing team. This system does it all, and provides a virtual franchise model for success. Displays your future revenue estimates from your active clientele. The CAM System™ also includes a powerful and unique Inventory Management feature. Nine basic inventory categories are provided and customized inventory categories can be added.. With a simple click, cases and leads can be moved from one inventory to another as they move through the sales process. You can view any single inventory list, or combinations of inventories, and sort the lists by any variable. These reports provide demographic information, follow up dates and tasks, revenue estimates, graphs and other information to help you evaluate both the quantity, and the quality, of your inventory. And because The CAM System™ is web based, you, or your assistant(s), can view, edit, and share individual case notes and details. The inventory section also allows email,, printing and file exporting to Word, Excel and PDF. Follow-up reminders can be set to recur at intervals of your choice. Clients can be categorized and stored in customized inventory lists by such variables as product, quality rating or services. The CAM System is perfect for year-end planning and quarterly adjustments. It generates a goal driven work plan and continually tracks progress. By entering your desired revenue, and a few other variables, the program will project an activity plan based on your own historical performance. A powerful “What If?” calculator allows you to evaluate the effect of varying your case size, number of closes or closing ratio. Vary the assumptions and watch the plan adjust! 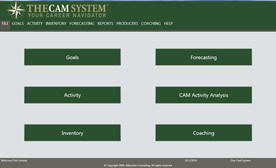 The CAM System also contains a unique coaching feature that displays suggestions from Dr. Barry Alberstein, which are a result of over 30 years of industry consulting. Dr. Alberstein has personally analyzed over 20,000 monthly activity and production reports from both new and experienced producers. His coaching practice includes numerous MDRT, Court of the Table, and Top of the Table members. The CAM System includes much of his proven coaching guidance that identifies possible problems and recommends practical solutions. It’s like having a built-in personal coach! The CAM System for Management from Barry Alberstein on Vimeo. The CAM System™ offers a powerful new paradigm for field force management. It provides an unprecedented level of information allowing professional management of the producer and a complete practice management system for the producer. It truly can be the producer's Career Navigator. The ultimate solution for off-site management.